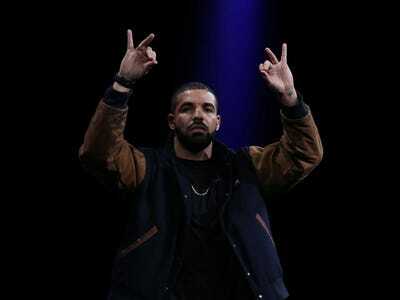 Earlier this month, Drake caused a stir when he appeared onstage at Apple’s Worldwide Developers Conference wearing a vintage letterman’s jacket with the company’ s classic rainbow logo. Shortly after Drake’s appearance at WWDC, we spotted an eBay listing for an identical jacket. 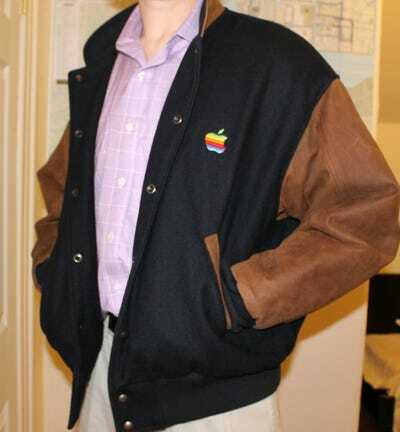 The jacket, which the listing said was made “strictly for Apple employees,” sold for $US825. Now another listing for the same jacket style has surfaced, priced at a whopping $US3,500. It’s listed by the same seller (biglampman44) as the $US825 jacket, but he claims this one could be the last of its kind. He says that he bought both of the jackets at auction. Apple used the rainbow logo from 1977 to 1998. The jacket is made out of wool, and it has leather sleeves.